"The Saturn Above It" (Slooh Space Books, 2016), edited by Karen Stevens. The vastness of the universe has lent itself to many imaginative short stories and science-fiction classics. The Slooh online observatory's first book, "The Saturn Above It," captures a series of literary works that explore unique human perspectives about space and our place in the universe. 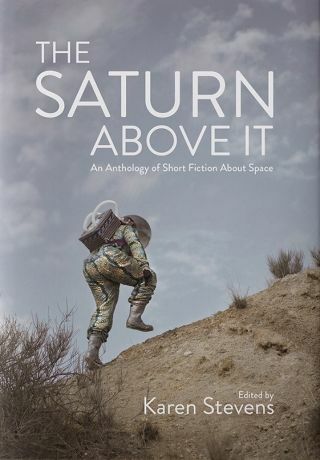 "The Saturn Above It: An Anthology of Short Fiction About Space" (Slooh Space Books, 2016), includes 21 short stories written by authors such as Don DeLillo, Primo Levi, Virginia Woolf, J.G. Ballard and Ray Bradbury. Each story captures a different feeling about space, ranging from the magic of totality experienced during a solar eclipse to the mystery surrounding other planets in the universe. After reading numerous collections of space-related stories and selecting those that stood out, Stevens worked with Eliza Booth, managing editor for the book, who obtained the proper copyright permissions. Space.com spoke with Stevens about how she chose which stories to include and how they all work together to explain the complexity of the universe. Space.com: What was the inspiration for "The Saturn Above It"? Karen Stevens: There are so many wonderful science-fiction anthologies already out there, so I started looking in a different direction, more at literary stories and literary visions of space as opposed to strictly science fiction. It was exciting, because I didn't think there was anything else out there like it, showcasing a whole bunch of different viewpoints in the form of short story, echoing Slooh's commitment to welcome everybody to look up at the sky together. Space.com: How did you find all the different stories? Stevens: I am a huge reader — it's a passion of mine. I knew I was going to look at Don DeLillo, because I love him, and John Updike, because I love his short stories, too. So I had a place to start. And, although I didn't have any specific stories in mind that I wanted to pull … I knew of certain authors that I was going to use. Space.com: How long did it take to compile all the stories? Stevens: We put it together really quickly. I pulled the first draft together in only a couple months, believe it or not — my eyes hurt from reading so much. Then, as I kept reading and Eliza did a read through, we would pull some out or put some more in. It took about a year from start to finish. Space.com: Was it hard to decide which stories to include, or were there any you had to omit? Stevens: No. Each story that we ended up using, I reacted very strongly to — I felt we had to have it. We had a little trouble with [getting copyright permissions for] the Don DeLillo story, "Human Moments in World War III" — and that was one that I felt the collection would have lacked without and I would not have known what to replace it with. DeLillo really captures the anxiety and dread ridden through modern society. The story is about these two men orbiting Earth. They have a military mission and war is ranging below them on this beautiful planet. That submerged dread felt by the two men I think speaks to how a lot of people have felt since the sixties — since the space age. That's how they sort of look at space: with a feeling of dread and unease. And I thought the story captured that so beautifully, while also talking about the Earth as seen from space in such an amazing way. Stevens: "Human Moments in World War III" by Don DeLillo was one of my favorites, just because I adore his writing in general. But another one I really, really loved was the John Updike story "Conjunction." The man struggles to connect with what was up in the sky and he had a really hard time doing it, and I thought that was the perfect [representation of] the Slooh mission — bringing people together who are looking for a community and a way to look at space without knowing how to use a telescope. The Primo Levi story "The Tranquil Star" was another one that I really loved. It talked about how it's really hard, with the language we have, to capture the immensity of space. And then at the end he [Levi] talked about the unexpected consequences things millions of miles away can have on our own personal lives. Space.com: How did you choose "The Eclipse" by Selma Lagerlof as the story you wanted for the book's opening"? Space.com: How did you decide on the title, "The Saturn Above It"? Stevens: It came from a line of the Robert Browning poem called "My Star," which is included in the beginning of the book. It is a beautiful poem that kind of emphasizes the idea that when you look up at the sky, what you see is what you see, and what you feel is what you feel, and there is no wrong or right way — whether you get excited about the science of space or how it makes you feel, or if makes you think of aliens. To me, that seemed like a perfect expression of the contents of the book. Space.com: Was there a certain way you chose to organize the stories so that they worked together to tell the story of space and our place in the universe? Stevens: I did organize the stories more so to create a rhythm — a long story followed by a short one. The first story I chose with a lot of care, to introduce the collection with an experience most people could relate to. Then, I chose to end with the [Leo] Tolstoy story because it had more of a universal viewpoint: We are all one under the sky. Space.com: Is there a certain message you hope to convey to readers? Stevens: [What] I really wanted to convey was the idea that books and stories, or anything about space, doesn't have to be science fiction. There are so many ways to approach space, it doesn't all have to be speculative; it can be a literary approach. I think writing about space is as simple as just, "What do I think when I look up at the night sky?" So I would like to sort of reclaim space away from science fiction and open it up to any genre. Space.com: This is the first book published by Slooh. How do you feel the collection ties into the observatory's mission? Stevens: The book is another way to reach people and talk about space and say, "All viewpoints are welcome." I never thought I would read about space and find it interesting or relevant to my own life — I thought it was all aliens and spaceships. I really loved getting that reaction from other people that read a lot but never really stopped to think, "Well, OK, space is where we live, we're citizens of the universe, we should be giving it more thought." It's my hope that it [the book] opens more people up to thinking about space. This interview has been edited for length and clarity. You can buy "The Saturn Above It" on Amazon.com.